The quality of education at Beloit College helps to explain why I was awarded a full scholarship for graduate study in the comparative literature department at Yale University. On numerous occasions thereafter, when asked where I had attended “school,” I immediately responded, “Beloit College, a small liberal arts college in Wisconsin.” Years ago, I began to refer to it only by name. There are dozens of other “small liberal arts colleges” throughout the United States that also offer the opportunity to obtain an outstanding education. It’s there to be earned and can have a huge impact, a substantial ROE (return on effort). One of these colleges is discussed in an article written by Michael Dirda for the American Scholar in which he shares “Nostalgia and longing for the middle of nowhere and the flowering of culture one finds there.” Here is a brief excerpt. 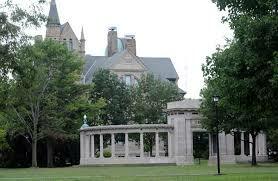 Over the past few weeks I’ve found myself thinking a lot about Oberlin College, my alma mater. During the National Book Festival weekend, held on the National Mall in late September, I spent much of the gala on Friday night with novelist Marilynne Robinson. In her latest collection of essays, When I Was a Child I Read Books, is one entitled “Who Was Oberlin?” (John Frederick Oberlin was a saintly, civic-minded preacher in 19th-century Alsace.) Turns out, moreover, that Robinson is a great admirer of those small, theologically grounded colleges that sprung up during the early-to-mid-19th century, and were led, as in the case of Oberlin, by men like Charles G. Finney, the most electrifying speaker of his time. Portraits show a man with piercing eyes that really do seem to bore into your soul. Because of the strong convictions of its founders, Oberlin College became our country’s first coeducational institution of higher learning and the first to admit both black and white students. The place was, of course, a hotbed of abolitionist sentiment. The social and political activism of Oberlin in the 1960s—my era—grew from more than 100-year-old roots. On Saturday at the book festival I got to talking with Tony Horwitz, whose latest book is Midnight Rising: John Brown and the Raid that Sparked the Civil War. He reminded me that many, if not most, of the men who rode with John Brown had graduated from or had connections with Oberlin. I actually knew this from having reviewed, a decade or more ago, Nat Brandt’s provocatively titled The Town That Started the Civil War. Brandt’s book focuses not just on Oberlin as an abolitionist stronghold and a stop on the Underground Railroad, but also describes in detail the 1858 “Wellington Rescue,” a key event in the lead-up to the Civil War, in which a band of Oberlinians marched to an adjoining village to free an escaped slave from bounty hunters. Michael Dirda is a Pulitzer Prize-winning critic and the author of the memoir An Open Book and of four collections of essays: Readings, Bound to Please, Book by Book, and Classics for Pleasure. His most recent book, part of Princeton’s Writers on Writers series, is On Conan Doyle. Dirda is also a frequent lecturer and an occasional college teacher.